Scientific artist Jonty Hurwitz creates the world's smallest sculptures. His latest work of art highlights the fragile state of the African elephant. Can art and science save the elephant from extinction? Merging cutting edge science and art, Jonty Hurwitz creates the world's smallest sculptures. His latest, "Fragile Giant," illuminates the danger poachers pose to elephants. 100,000 African elephants have been killed for their ivory in the last 3 years. When we last visited Jonty Hurwitz’s studio, the scientific artist had just completed the world’s smallest sculpture, “Trust.” Truly out of sight, Hurwitz’s nano-sculptures are small enough to hide on a single human hair. Read our previous article about Jonty’s amazing nano-sculptures here. Hurwitz is back at it. His latest work, “Fragile Giant,” points his pioneering blend of art and science at elephant poachers. “Fragile Giant” is the smallest man-made object ever to be filmed — and were it not for the wizards at Karlsruhe Institute of Technology (KIT), Germany, it would remain a sight you literally couldn’t behold. With “Fragile Giant,” Hurwitz highlights the fragility of the world's elephant population. Ivory-seeking poachers have killed 100,000 African elephants in the last three years alone. 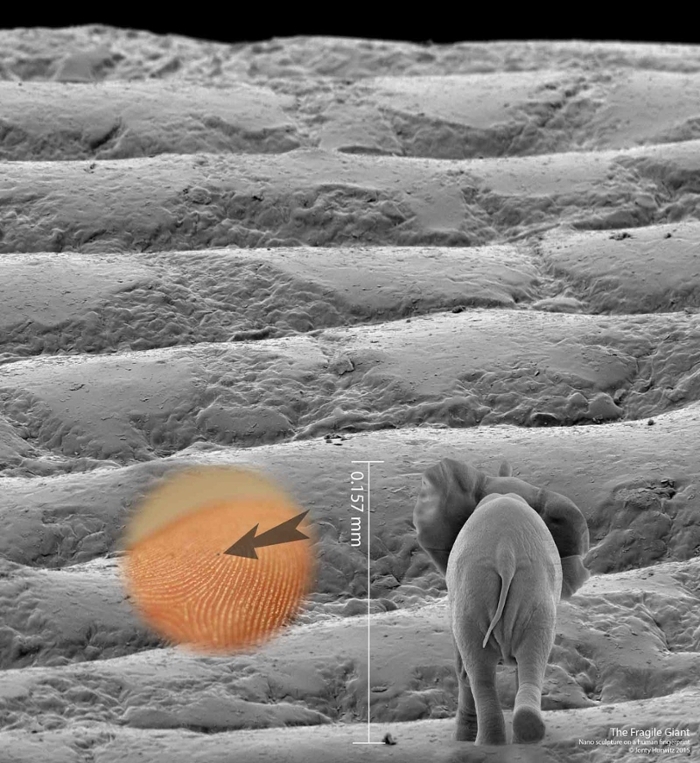 “We can place a microscopic elephant between the grooves of a human fingerprint, but we don't seem able to save the species from our own hands,” says Hurwitz. Over 100,000 African elephants have been killed for their ivory in the last three years, and artist Jonty Hurwitz wants to do something about it. He created his nano-sculpture, "Fragile Giant," to bring attention to the crisis. Courtesy Jonty Hurwitz. 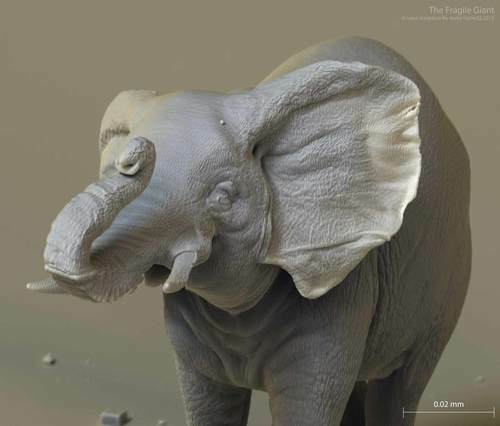 Hurwitz has reduced the world’s largest land mammal to 0.15mm, as if he is trying to shield the elephant from oblivion. Built using the same techniques as his previous works, “Trust” and “Cupid and Psyche,” “Fragile Giant” borrows from photogrammetry, electron microscopy, 3D printing, and multiphoton lithography (MPL). To bring the “Fragile Giant” to life, Hurwitz turned to nano-photographer Stefan Diller, who has developed a system he calls the Nanoflight Creator. Diller employed a scanning electron microscope (SEM) at a magnification of 4,800x, capturing hundreds of images as a Piezo stage rotated to a precision of less than one ten thousandth of a degree. As with the MPL technique, the SEM frame capture technique is a slow process — one second of video can take up to 4 hours to film. But the results are worth the wait, and Diller’s system is the only one in the world capable of capturing such small images. Lucky for us all, Hurwitz remains fascinated with nanotechnology and frontiers where science merges with art and innovation intersects with imagination.